Vanilla Shakeology – A Must Try Flavor! You cannot come across many meal replacement shakes that are healthy as well as good to taste. Beachbody, however, breaks the ice by introducing Vanilla Shakeology the healthiest shake with more than 70 whole food ingredients. Vanilla Shakeology is a new breakthrough flavor that came out after two years of meticulous testing. Now you can pick out your healthy shake from a lineup of 4 Shakeology favorite flavors (Chocolate, Tropical Strawberry, Greenberry and the New Vanilla). Very soon the Beachbody Challenge Packs will also include Vanilla flavor Shakeology to add to the fitness results while you workout with your favorite programs. With Vanilla Shakeology, add yummy (dessert like) nutrition with best fitness workouts and live hale and healthy. Without sacrificing the high quality ingredients used in the Shakeology meal replacement shakes, Beachbody offered this new product in a most authentic form. There are no extra flavors, sweeteners, steroids or any artificial flavors (in fact, no artificial anything) in any of the Shakeology options, including the latest Vanilla Shakeology! The swirl of Vanilla Shakeology and Chocolate Shakeology is definitely worth a try. By blending 2 parts vanilla and 1 part chocolate flavor together you will something totally amazing. You can surely never get enough of such a blend. Choose the option to buy Vanilla Shakeology and alternate it with Chocolate bags on a monthly basis. You can also get only vanilla flavored Shakeology 30-day bags and boxes of 24 packets. Stay tuned to get updates in vanilla/chocolate combo packets (12 vanilla packets and 12 chocolate packets) to become available at the Beachbody story – later this year. 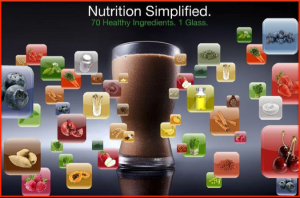 The amazing healthy ingredients that the Vanilla Shakeology contains help to achieve total body transformation results. With this Shakeology flavor, you will be taking in 130 calories, 16g of protein, 14g of carbs, 7g of sugar, and 2g of fat. The protein count in the Vanilla Shakeology comes from whey protein, with added small amounts of natural pea protein to round out the amino acid profile. Moreover, like other Shakeology flavors, Vanilla Shakeology has no gluten-based ingredients in its formula. Get Vanilla Shakeology For Better Weight Loss Results! Vanilla Shakeology Results are as amazing as other flavors. The term known as Shakeology Boost is the boost of fiber in the body with the help of super food formula added in the New Shakeology. With more fiber, your stomach will not crave for the junk food, as you will feel fulfilled for a longer time while feeling energetic and more vibrant all day long. Better digestion and fewer calories intake will also result in weight loss. Simplify your nutrition with Vanilla Shakeology without ever getting sick of the flavor. Customize it like anything you want to taste, as you can never go wrong with vanilla. Try Vanilla Shakeology today and give your taste buds something new to talk about!